Just some cute pictures for all the cat lovers out there. Mimi (dilute calico) is quite a fan of a good quilt. In fact, she is sleeping on it now (although she moved). Cory (torti) has moved to the other bedroom. This is a cute one because my girls aren't buddies. They don't fight but they like their own "spaces." I guess the blanket brought them together! Being on the roll that I am, I have another finished quilt to post! I first mentioned this flannel lattice top a while ago, when it was hot out and no one would want a flannel quilt. I noticed I said it should be done by winter - ha! That didn't happen but it is done now. There are thunderstorms outside and the small apartment doesn't lend itself to glamor quilt shots. However, you can see it is done and quilted. I just did wiggly lines all over and used the flower print for the binding. This was for my bestie and she really likes it. The pattern is from Layer Cake, Jelly Roll & Charm Quilts by Lintott. 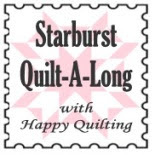 Great book - I've made a few quilts from it and I'm always happy with the outcome! Now, I have two more quilts to quilt and finish. I am using a "no new quilts before WIP are done" rule. As much as I like WIP, I have way too many! Next on the quilting block are my Sparkle Punch and STARS QAL tops. I made it my goal this summer to finish some WIP that I have floating around the house and to get the house decluttered and cleaned up. So far I have my room almost done, which is pretty awesome seeing how it is the craft/bed/cat/storage/misc room in the apartment. I'm excited to finish up since I've been organizing my sewing materials and finding fabric I forgot I had! I also destashed a bit and put a lot of my stash in a bag to make quilts for charity. So, the bright news is - Lemonade is done! I made the top last summer during crazymomquilt's 36 patch quilt along. I had some leftovers from Connecting Threads Sip of Summer jelly roll sampler that I decided to use. What I really liked about the quilts we worked on during this QAL was that we all busted some funky stash fabrics - and the results were always lovely! I did the binding in orange with white dots. I had more of the sampler left but couldn't find it in the cleaning. As one would guess, I finished the binding last night and found the fabric this morning! For the quilting pattern, I decided to try something new. Since "adopting" Bobby, I have enjoyed doing free motion quilting and having the room to move things around. I saw this tutorial for orange peel quilting and thought I would give it a shot. If you have a quilt with a natural grid, I totally recommend trying it out. I practiced a bit and found I was more comfortable doing half circles up and down the columns. This kept them less wonky for me. To each their own! It is gonna look super once I get it washed and wrinkled. I used a light buttery yellow from Connecting Threads to do the quilting. So very pleased. I realize I haven't been around the bloggie in a while. The last bit of this semester was kicking my behindie and I didn't have time to get my blog on. 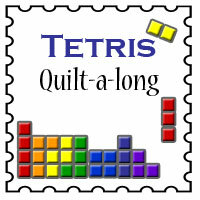 However, lack of blogging does not mean lack of quilting! I have a couple months of Beejeebers to report on. Blocks for April and May: Done! Makes me wonder if I reported on March. I'll post that baby just in case! Other activities have focused on finishing UFOs around the house. The flannel lattice quilt is done. Lemonade is quilted and I'm working on the binding. STARS QAL is ready for quilting. Sparkle Punch QAL top (cider punch is what I call mine) is ready to sandwich. Currently quilting a kookie project for my sweetie that I plan to make a little tutorial for - not that it needs it! I'll have to get good pictures of those projects once they are finished. Once I clear these "almost done" projects, I have a couple lightly started tops to work on in addition to a new project I plan to work on this summer. We'll see how far I get!